Next week, Drug Channels Institute will release our updated and expanded 2014-15 Economic Report on Retail, Mail, and Specialty Pharmacies. The exhibit below—one of 110 in our new report—provides a sneak peek at the largest pharmacies, ranked by total U.S. prescription dispensing revenues for calendar year 2014. 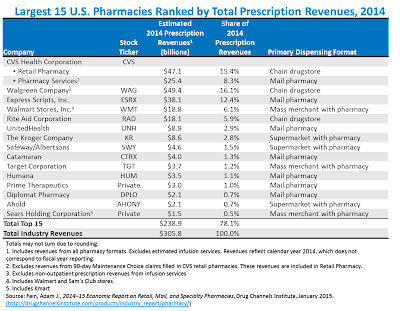 The top 15 pharmacies accounted for almost 80% of the pharmacy industry’s revenues. The specialty boom is reshaping the pharmacy industry’s market structure, as evidenced by the prominence of PBM-owned pharmacies with substantial specialty operations. Read on for the 2014 details. For a sneak peek at the new 2014-15 report, check out the free Overview. Here’s Exhibit 11 from the new report. Click here to download this chart as a PDF file. We estimate that total revenues of retail, mail, and specialty pharmacies reached $305.8 billion in 2014, up 7.0% from 2013. 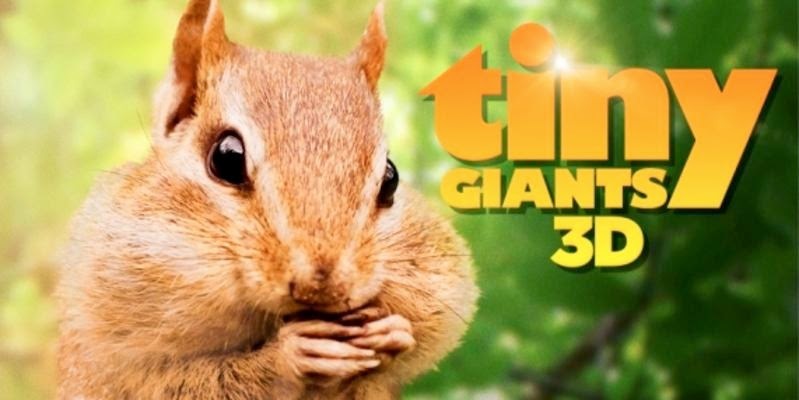 The five usual suspects—CVS Health, Walgreens Boots Alliance, Express Scripts, Walmart, and Rite Aid—accounted for almost two-thirds of dispensing revenues. For the top five pharmacies, market share concentration in 2014 was comparable to that of 2013. 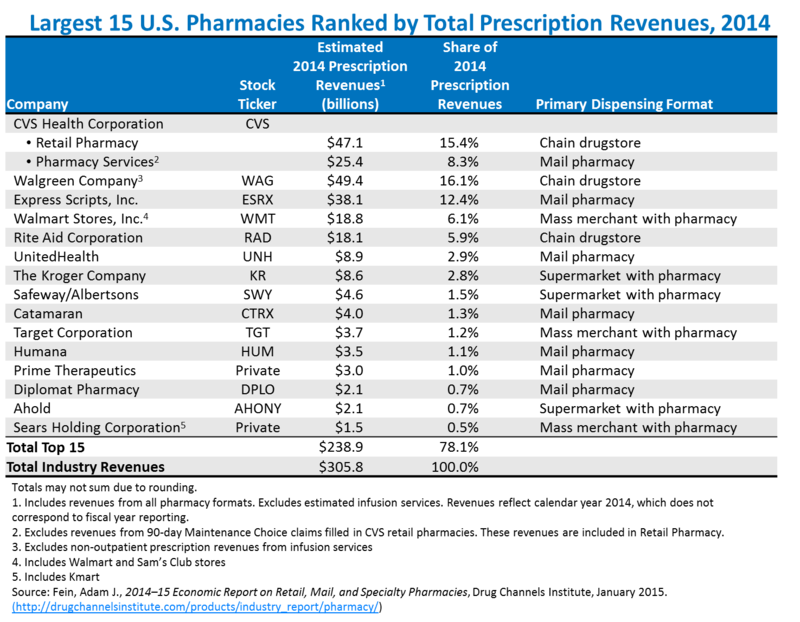 While retail chains remain the largest players, many of the biggest pharmacies (by revenue) are central-fill, mail pharmacies operated by such PBMs as Express Scripts, UnitedHealth, Catamaran, Humana, and Prime Therapeutics. Specialty drugs account for 30% or more of revenues at these pharmacies. In a future excerpt from the report, I’ll publish our estimates of national market share for dispensing specialty drugs. Note that the revenue figures are calendar year estimates, so they do not necessarily correspond to fiscal year reporting. For retail pharmacies, market share in a particular geographic region or market can differ greatly from the national averages. P.S. Feel free to cite and link to these estimates. As a friendly reminder, please attribute the source properly. Tracking Pessina's Net Worth <---- There should be an app for this, if not perhaps someone should start building it ASAP.